The bake and/or broil element never gets hot. It’s not getting any power at the outlet…DUH! Well, maybe it’s burned out. Attaway, Hoss, just go ahead and replace it with the assumption that nothing else could cause a no-bake condition. How ’bout checking the continuity of the element? Whoa, there’s a brain flash, ya hey? Should read in the range of 20 to 40 ohms. More help on how to troubleshoot it on this page. ‘Course, it could also be a burnt or loose wire to the bake element. I’ve seen it alot. Could be a bad function selector switch, too. Kids and visitors are great for screwing with the mechanical clock "start" or "stop" knobs and pushing them in so the oven doesn’t work. The oven sensor could be open. You’ll need to ohm it out with… wait for it… your ohm meter. Your electronic range control (ERC) board could be fried. Usually, there are self tests you can do for this and the wiring diagram has the key sequence. The thermal cutout switch might be open. I can help you find it if you’ll start a new topic in the Kitchen Appliance Repair Forum. The oven won’t self-clean anymore. Your self clean latch is bent or misaligned. Inspect for proper alignment to make sure that latch is contacting the latch switch. The self clean latch switch is fried. Check continuity. Function selector switch is fried. The clock doesn’t work anymore. If you have a mechanical clock, the clock motor winding could be open, in which case you’ll need to replace the entire clock. You might be lucky and only have a burnt wire or bad connection supplying power to clock. 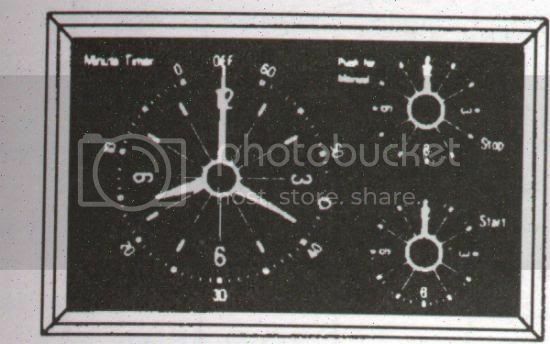 Check voltage at the clock motor. Fried ERC (on ovens with LED digital display). Nolo Contendre, compadre. Come git you a new one. Oven works but it just doesn’t get hot enough. Oven sensor is FUBAR. You’ll need to ohm it out using a good digital ohmmeter. Check that oven door gasket for rips and tears. That’ll do it, too, Hoss. Bad voltage at oven electrical receptacle. 240v should be measured at the oven receptacle from L1 to L2. 120v should be measured from L1 to neutral and from L2 to neutral– details on this page. Check circuit breaker to make sure it’s not tripped. "I turn the oven on and it goes straight to balls-to-the-wall high heat. Wassup?" Yo, mon, how ’bout checking that thermostat? Contacts should be open at room temp. Maybe your oven relay is fried. These little gems were mainly used in ovens made by Frikidaire (no, I spelled it that way on purpose). This includes Kenmore ovens made by Frikidaire. Oven temp is as erratic as a bat outta…well, you know. Check that oven sensor, Hoss. Read this page for more about how to measure oven temperature. "My oven door is stuck closed. I’m gonna die! HELP!" You might have a fried ERC. This would mainly affect ovens that have automatic door latching in self clean (no lever), such as Jenn Air’s and some other Maytag brands. Check for error code in display. If an error code is given, check against manufacturer’s code explanations in owner’s manual or tech data sheet inside oven control panel. The self clean latch is bent or someone tried to do the gorilla routine on it. You’ll need to disassemble the oven to get at it. Have fun, Homer– glad I ain’t doing it! Getting an error code on the oven clock. Appliance manufacturers (praise be their holy names), in their infinite wisdom and mercy have determined that it is in our best interest that they carefully guard the meanings of their precious fault codes. And to make our joy complete, they even vary the codes from model to model! So, even though there are no standard fault codes, even within the same brand, Allah has revealed all appliance fault codes to me in a dream. Yea verily, God bless Allah! The bake and/or broil burner do not fire up. The bake ignitor is shot. Listen, Bubba, you can’t tell it’s bad by just looking at it–you gotsta measure the amperage. Just because it glows orange, doesn’t mean it’s good. On round ignitors, look for a current draw of 2.6 to 2.8 amps. On flat ignitors, look for 3.2 to 3.6 amps. Low current draw will not allow the gas valve to open. The valve is fried. 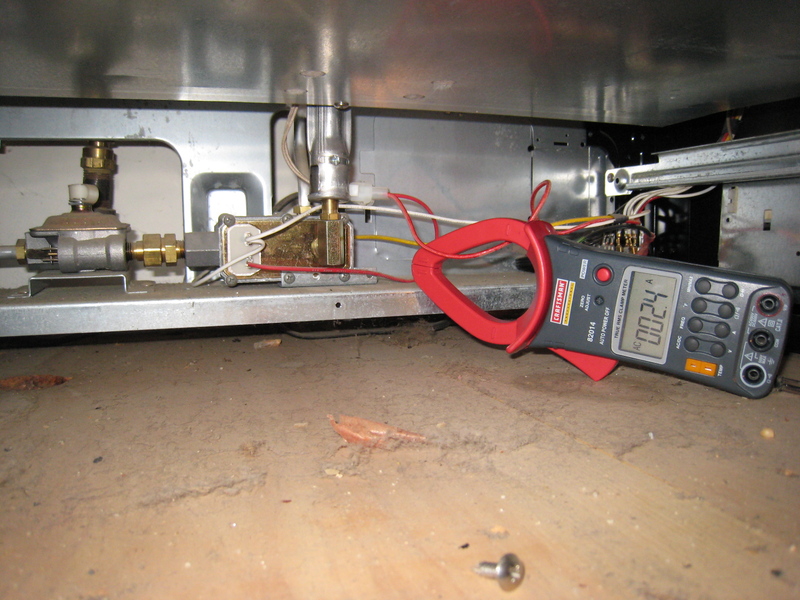 If ignitor checks out OK, remove power from oven, pull the two wires off the valve and ohm test. Should read two to five ohms. If open, replace valve. The pilot is out…DUH! Try reigniting the pilot. If it goes out again, check 1) gas supply (out of gas, crimped line, etc. ), 2) pilot orifice clogged or dirty. Pilot flame not wrapping around thermocouple. Reposition the thermocouple bulb so the upper third of the pilot flame wraps around the thermocouple bulb. Did I lose y’on that one, Bubba? If so, you better take it to the repair forum ’cause you ain’t gettin’ any smarter staring at the screen. If pilot is spark ignited and you’re not getting spark to the pilot, replace the spark electrode, spark module, and the ignition wire. These parts are inexpensive enough that it’s not worth the trouble to just replace one, replace the entire ignition system as long as you’re in there. "The oven just doesn’t get hot enough and it ruined my angel food cake. I’m just gonna die!" A good ignitor will fire the oven in less than three minutes. If it takes longer than this, the ignitor is toast or on its way to becoming so. Use your clamp-on amp-meter to measure the ignitor current draw. If the current draw is insufficient or borderline, then replace the ignitor. Budda-bing, budda-boom, done. Check the door gasket, Homer. Still confoosed, Grasshoppah? Browse all the FAQs for ovens and ranges. To learn more about your range/stove/oven, or to order parts, click here. This entry was posted in Oven Repair, Range Repair on December 1, 2007 by Samurai Appliance Repair Man.